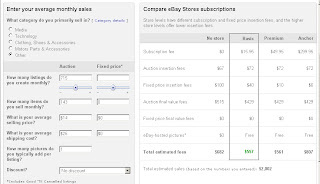 The Fee Illustrator on http://pages.ebay.com/sellerinformation/news/FeeIllustrator.html is a program done by ebay to compare fees in the selling options that they offer. ( please click on the picture to enlarge it ). 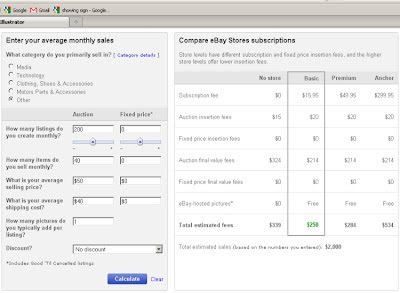 For instance a Basic store is the cheapest and most valuable shop option in the ebay offer, with 250 $ of total fees ( in June 2011 ) for a total monthly sale of 2000 $, ( excluding transport ) consisting in 40 shipments of 50 $ each. The transport cost of each shipment is 40 $. 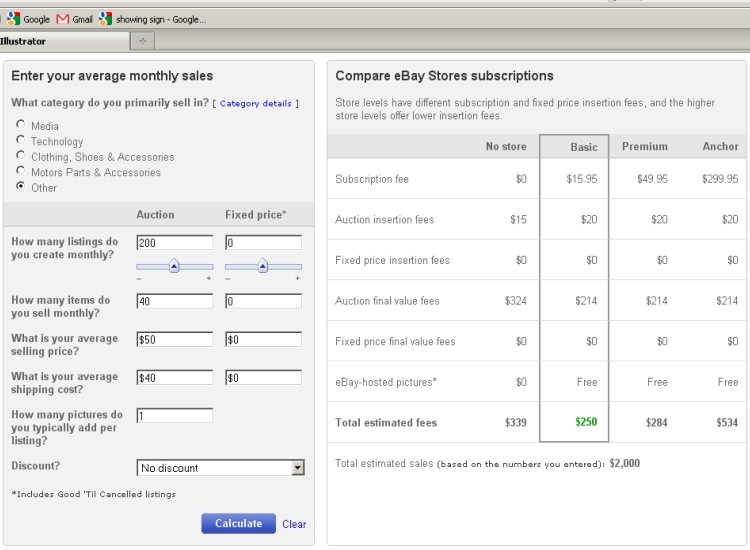 No shop to sell the same monthly amount on ebay would generate less fees for sellers to pay. 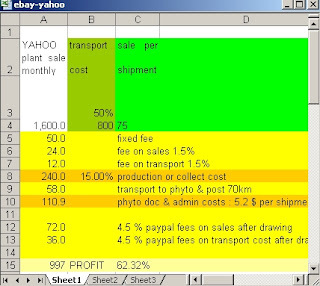 At first glance this doesn't look bad, 250 is not a big percentage of 2000, a figure for a relatively high level of sales on ebay; but, especially as live plants are concerned this amount of fees turns out to be high when linked to several facts : first, at least 15 % of the sales plus their transport cost will have to be refunded to the dissatisfied customers. 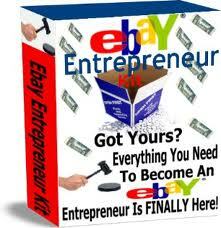 ( This figure of 15% may seem small though compared to the advantage of the high traffic on ebay platform ). Then Paypal fees are high especially for a country where drawing to the bank account a Paypal balance requires conversion at a Paypal exchange rate not favorable at all. For instance in Thailand receiving money on a Paypal account and drawing it to one's bank account generates a total payment to Paypal of about 4.5% of the amount. ( which is significantly more that the 3.4 % announced by Paypal before exchange rates are applied ). 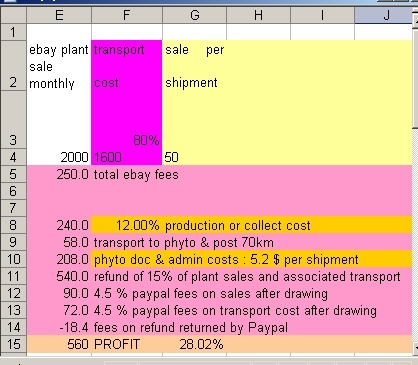 Below is a cost simulation for a total monthly sale on ebay of 2000 $ of live plants from Thailand; our demonstration presents a surprising conclusion - an ebay sellers gets no more than 28 % of the price of the plants sold .. if this figure is not based on a too optimistic assumption. I assume that 40 EMS parcels are shipped per month, transport cost is 40 $, plant prices total 50 $ per parcel and 200 listings are done monthly. 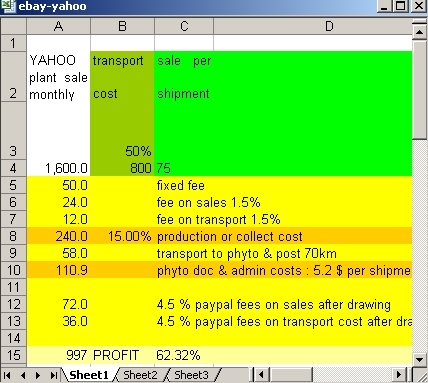 The plants amount per shipment to 50$ and the transport cost is 80 % of this value. So the transport cost per month is 1600$. Here is a first problem for the seller : the transport cost is so high for the value of the order that it will generate high Paypal fees and high returns of transport costs to dissatisfied buyers when claims will be faced with. The transport cost refunded to the buyer is paid by the seller to the post office and it is lost for the seller. 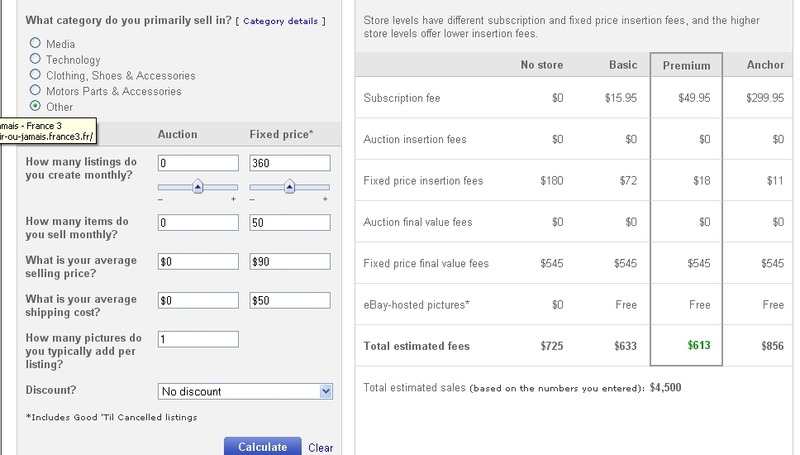 minus 250 $ : they are the total ebay fees ( shop rental and all other fees ) as shown on the ebay Fee Illustrator. I assumed quite optimistically that no more than 200 listings would generate 40 sales. 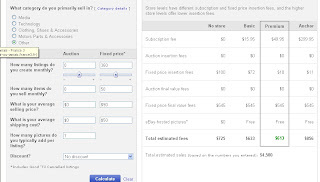 All listings are Auctions in this example, in order to save on fees ( with harder work and longer time sit at the computer of course ). If the 200 listings were 100 Auctions and 100 Fixed Price, the fees would be higher than 250$. minus 240 $ , 12% in production or collect cost : land, labor, transport, inspection on site, infrastructure and maintenance etc. It is worthy to note that wherever in the world, land near a phytosanitary office cannot be cheap. 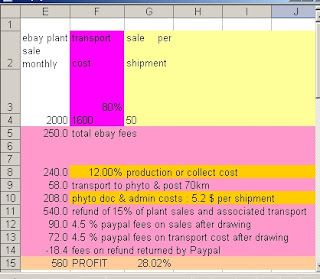 But few plant species with a value of 25 $ each can incur a so low transport cost by EMS. I was optimistic regarding the weight of the plants in my example. 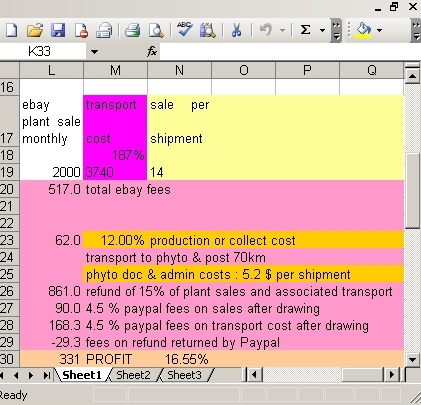 the sale of Hoya plants at 35$ for a cost of transport by EMS of 33$ ( 33/35 = 94%). 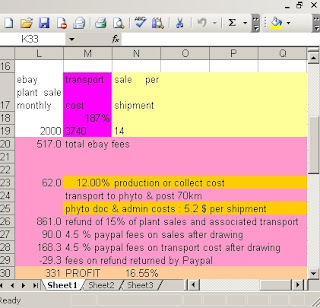 The seller ships 50 parcels monthly ( 50 x 35 = 1750 ) Although the cost of production is assumed to be a mere 12%, only 101 $ are left to the seller at the end of the month ( 101/1750 = 5.76% ) ! These retailers exporting Hoya on ebay get 2 $ per sale of 35 $ of the plant price per parcel. The final profit to the seller has now dropped to - 23.5 % or minus 470 $ although I set the production cost at a low 12% of the sale. The value of the sale ( caused by the number of plants sold ) is too low per shipment, which generates too high transport costs, too high phytosanitary and document costs as those are spent per shipment ( 5.2$ per parcel ). The high transport cost refunded to dissatisfied buyers ( or would be competitors ) has a strong impact, even though fees on it are returned by Paypal. 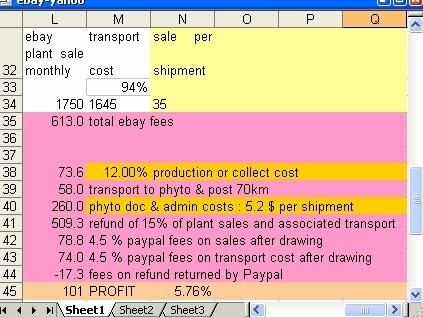 Don't you believe my calculations showing that selling on ebay can often generate negative revenues, like this - 23.5 % of the plant price ? Go on ebay see prices of plumeria, number of those sold per parcel and the associated transport cost. Guess how many listings have been created per sale, and use the fee Illustrator... then do a little work on an excel sheet. Left is the situation where the Plumeria are sent without documents : the net revenue does not appear negative, but it is only 16.55 % of the price, assuming that no more than 15 % of the buyers will claim replacement or refund, and still assuming quite optimistically that 715 listings will be enough to generate the monthly sale. In the study case below I take a real example of a different kind from ebay : the seller is wise and set a minimum sale per shipment of 90 $ ( sets of 2 or 3 plants with possible substitutions I guess ) and EMS cost is 50 $. ( 56 % of 90 ). There are 12 pages in the shop, they display 360 listings. 50 listings are shipped monthly. The fee Illustrator indicates that Fixed Price listings in a Premium shop is the best option, please click on the picture on the left to see the details. 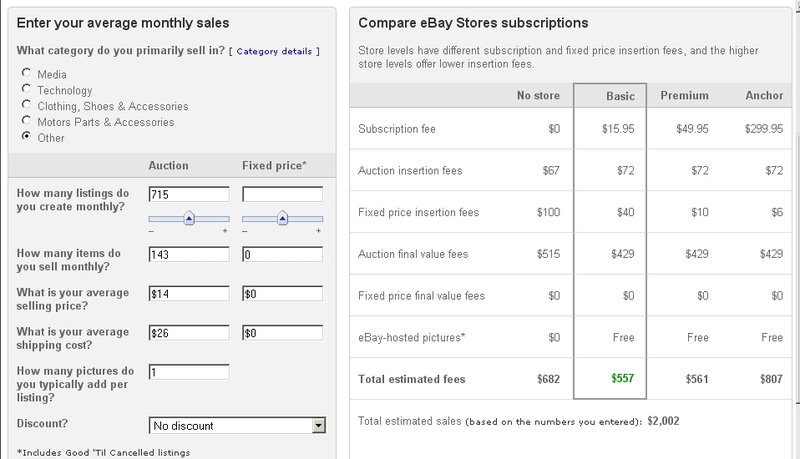 The total ebay fees are 613$, Paypal takes 279.2$ ( 613 + 279.2 = 892.2 ) and from a monthly sale of 4500 $ the seller gets a net 2167$ or 48.15% . 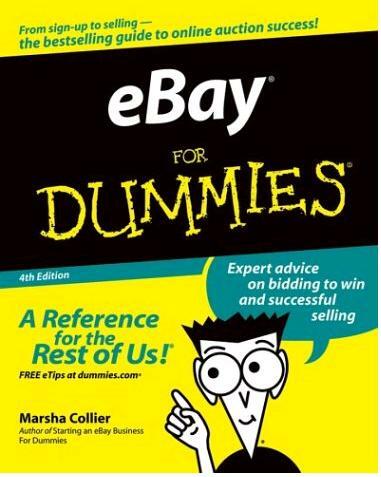 Is selling on ebay worth it ? the answer is crystal clear : not for sales of low values with relative high transport costs. 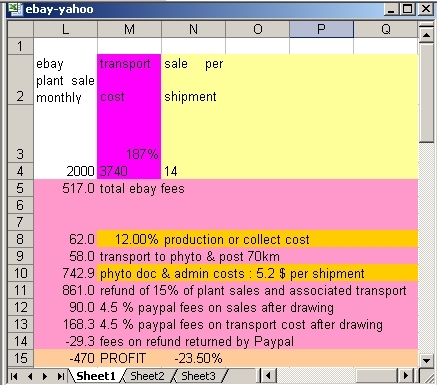 Many sellers pay from their savings to sell live plants on ebay ( especially heavy plants that generate high refunds of transport costs, also some sellers worsen their situation by biding and buying their own plants just to maintain their high rank in search engines among other costly techniques ); just because they are confident that a selling platform with so many member sellers worldwide can only offer great opportunities, whereas a few moments with a calculator in hands would have brought them the truth. 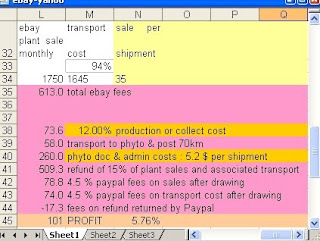 Total : 997 $ or about 62 % is the net income before tax to the seller on the Yahoo platform from an initial sale of 1600 $ of live plants. If we compare in a nutshell ebay and Yahoo we can say that selling on Yahoo doubles the income left to the seller while prices of the purchases are decreased by 20 % in favor of the buyer. ebay would be a better selling place both for sellers and buyers of live plants if lower fees were grasped, with the option to set a minimum order so the part of transport and document costs could be reduced thanks to a higher minimum of sale, with the possibility for sellers to rate the buyers so that refunds and replacements based on abusive buyers and would be competitors could be reduced. And what about buyer protection ? 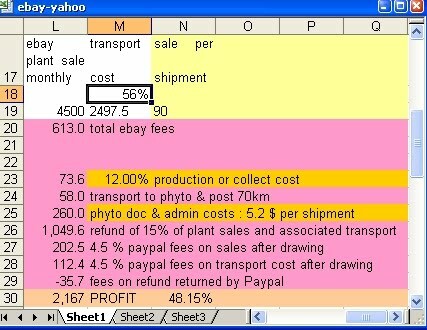 purchases on ebay or Yahoo ( or any selling platform or site ) are guaranteed by the same protection from Paypal : a non arrived parcel of live plants will be refunded by Paypal but a claim on the basis of the item being Not Received As Described will be rejected by Paypal, whether the purchase was on ebay or on Yahoo. The differences between the two will lie only in the use of ratings, Yahoo having a rating system relatively more cumbersome to use than ebay.